...and the wee black dug has realised that she can use her plastic appendage to her own ends. Most animals in my experience, just get totally freaked by the bucket. 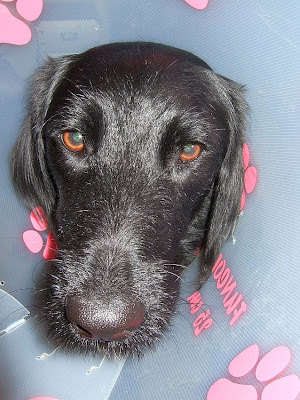 She's learned that if her and Molly start the usual playfighting, she can use the collar as a partial suit of armour, rattling the side of it into Molly's face and then choosing her moment for a full frontal lungeing assault, whereby Molly's heid goes into the bucket the wrong way, leading to much panic on the latter's part. It's also the ideal implement for creating a firm seal around any bowls of food that are lying unattended on the ground. It involves her sticking her face in the bowl at an awkwardly vertical angle, but that's a small price to pay for an extra dinner in Jorja's world. Oh, and note to self. Next time, don't poke your head round the half-open kitchen door to see what mischief she's up to because she runs out, the bucket catches the edge of the door and the only thing that stops it slamming shut is your forehead. "take it off or I'll rip out your insides with a teaspoon"
It's pretty much the definition of 'the evil eye', isn't it? They say that dugs dinnae hold grudges. That one looks like she might be the exception.